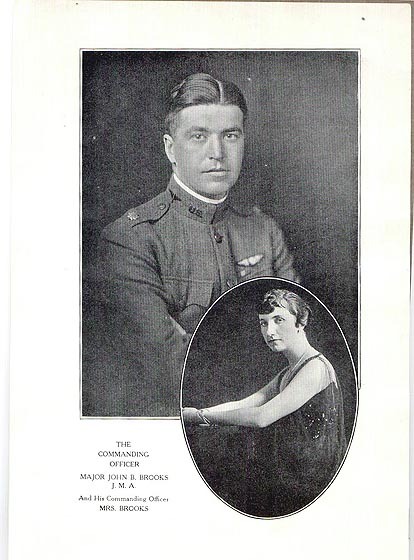 Page 2: Picture of Commanding Officer Major Brooks and Wife. 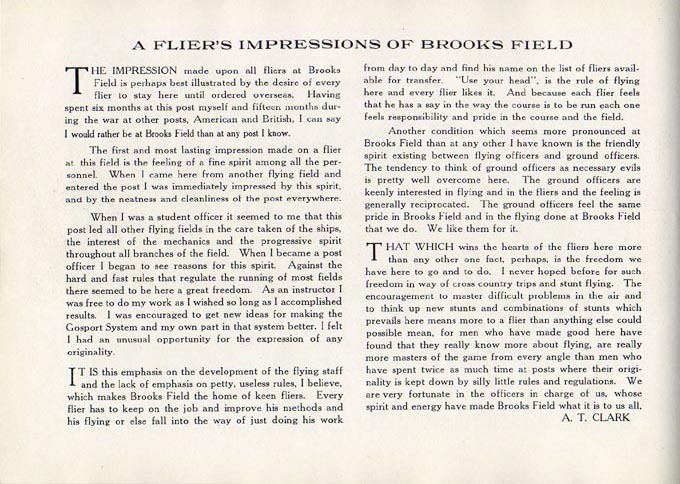 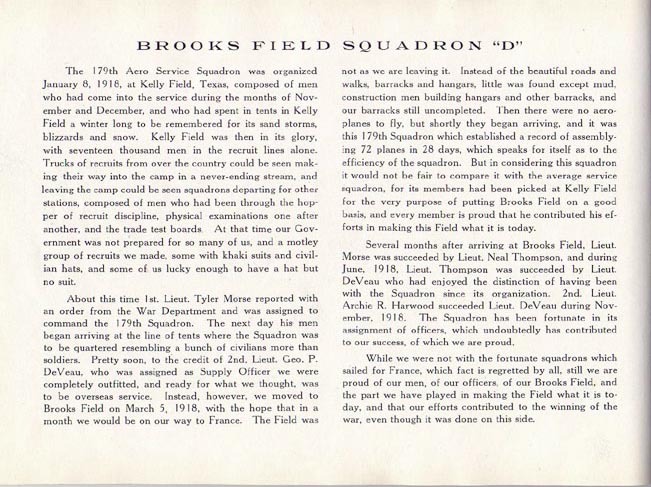 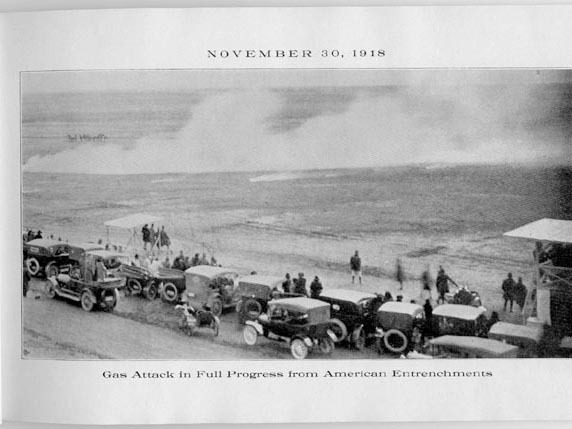 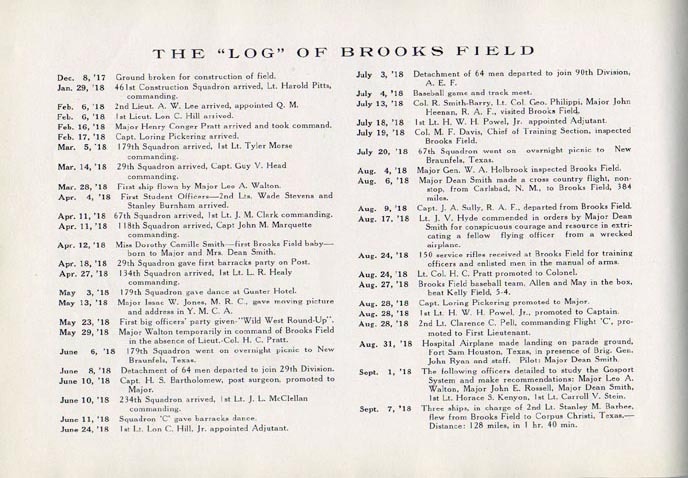 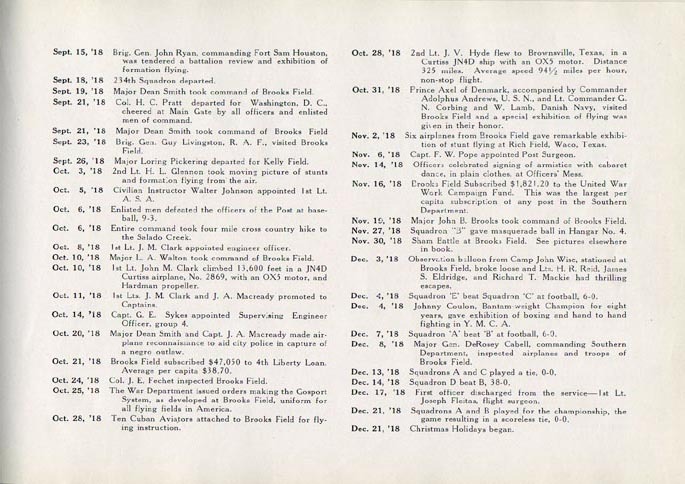 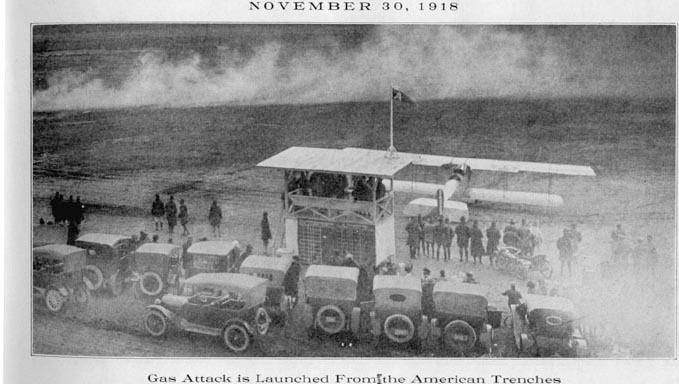 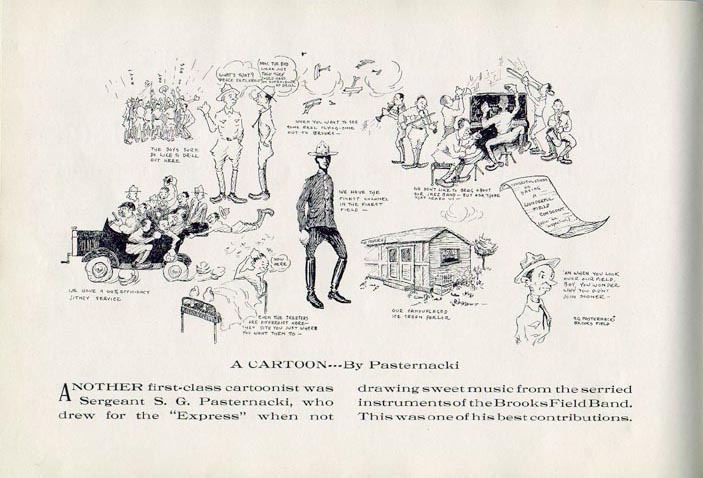 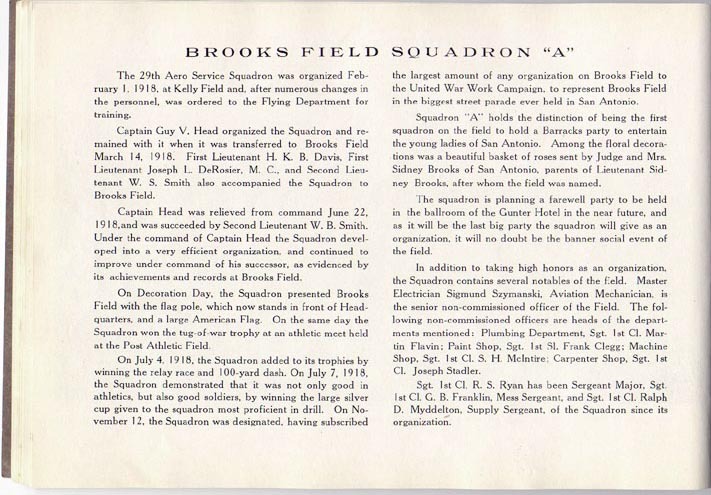 Page 3: Over view of Brooks Field history. 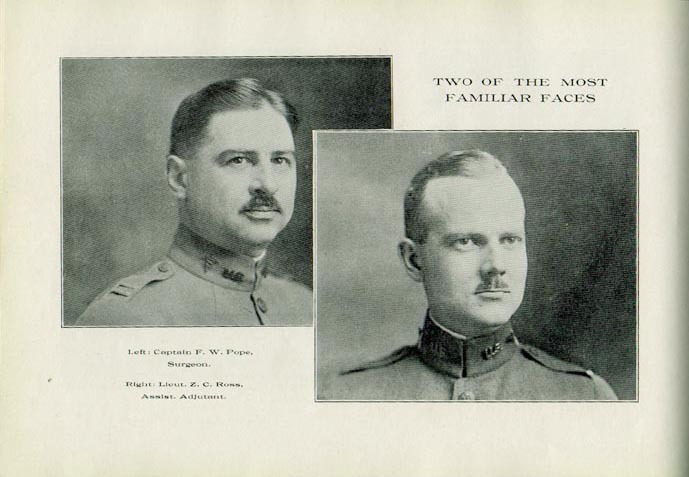 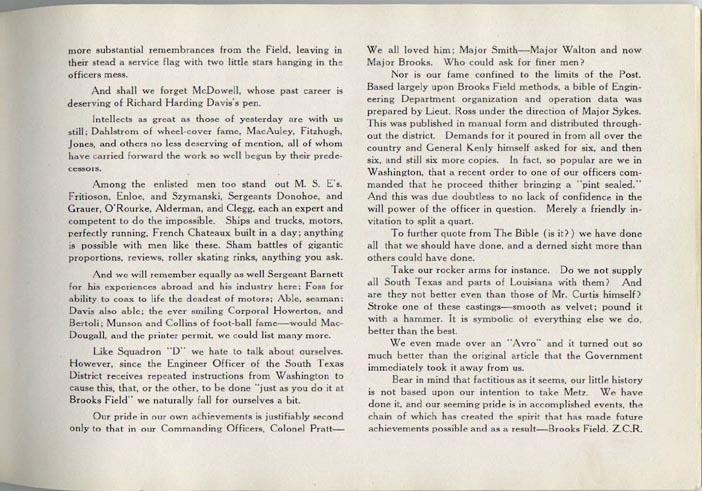 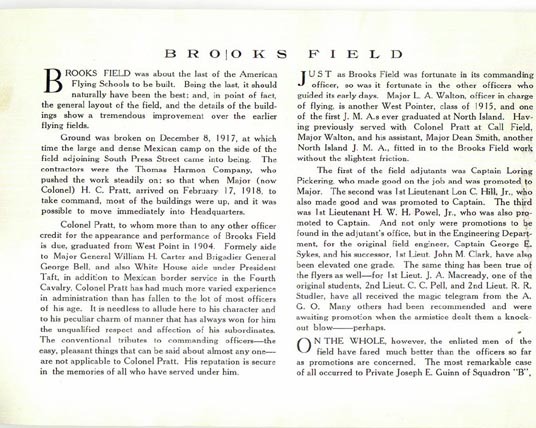 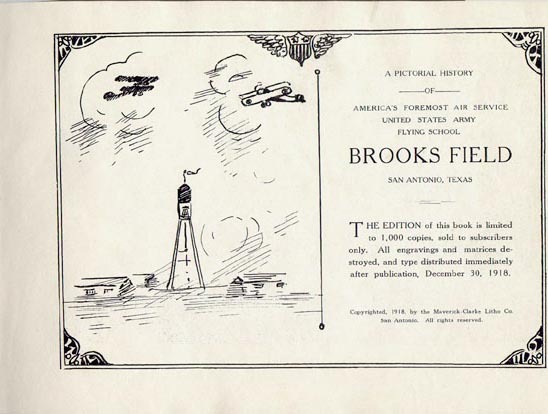 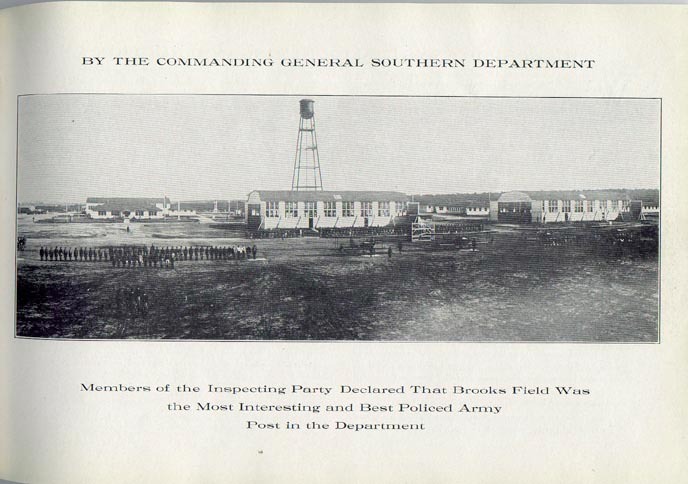 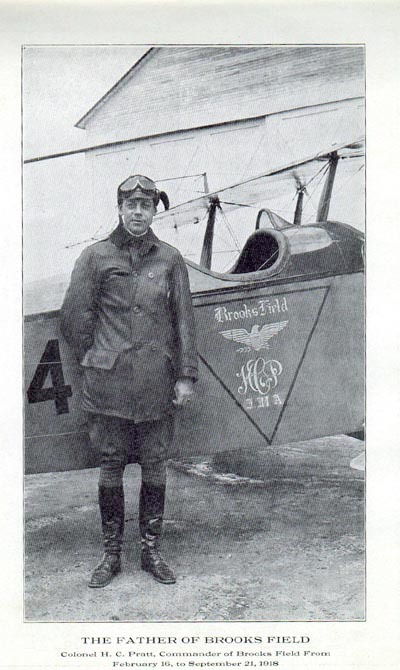 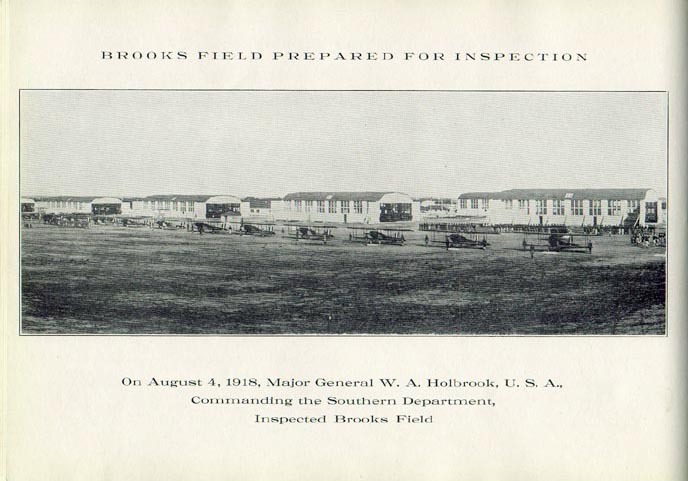 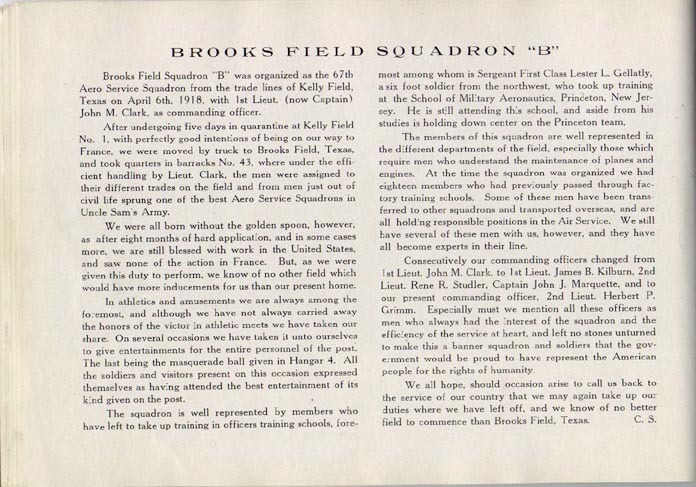 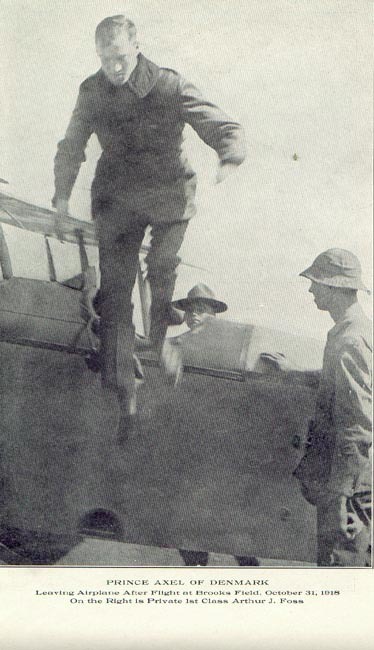 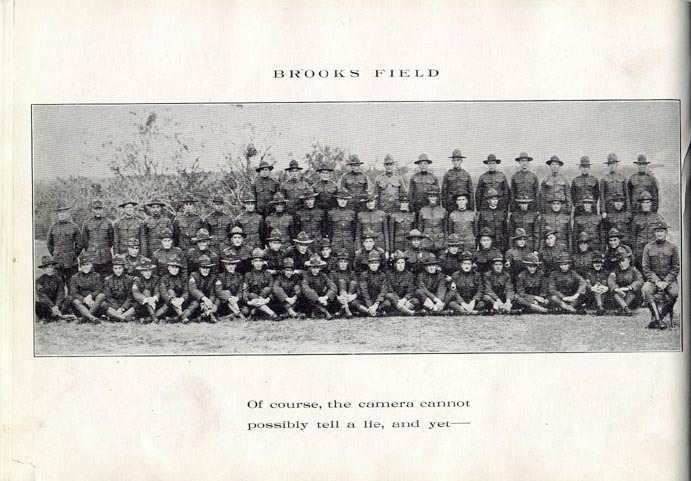 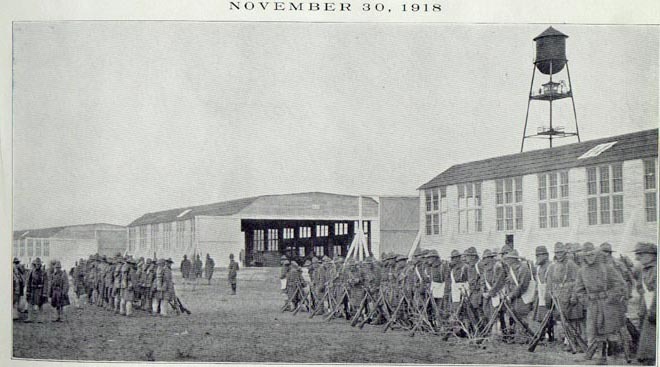 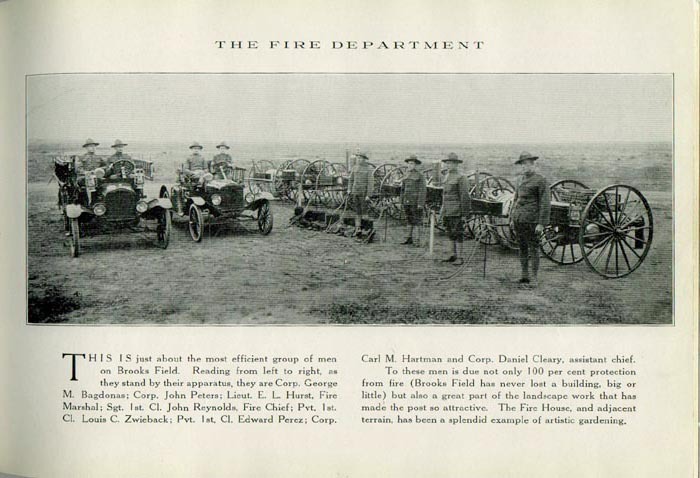 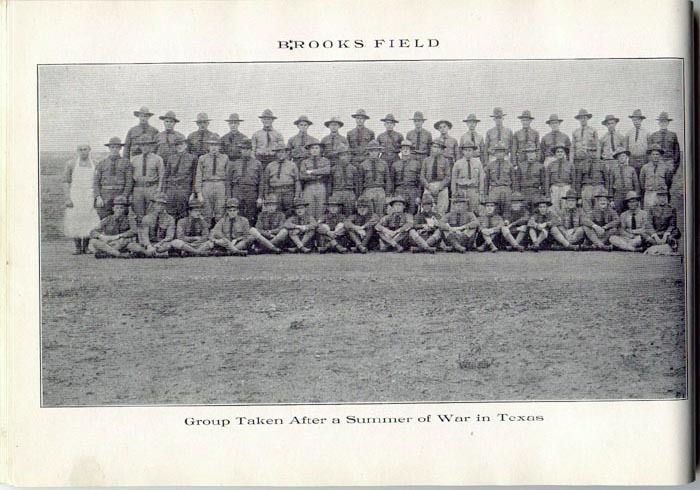 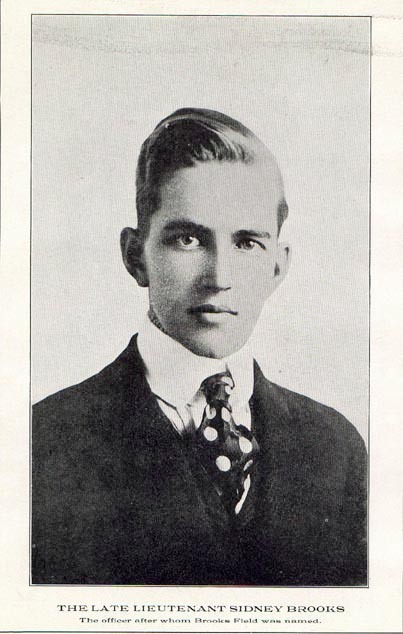 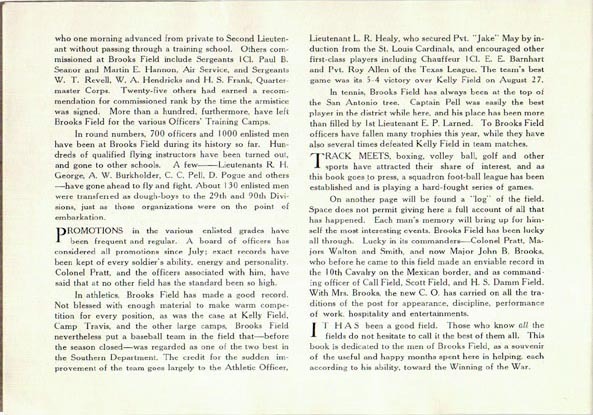 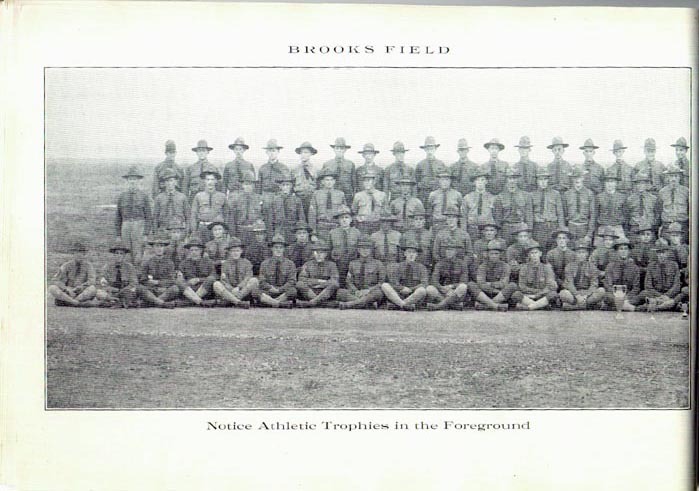 Page 6: Picture of Lt. Sidney Brooks, Field named after him. 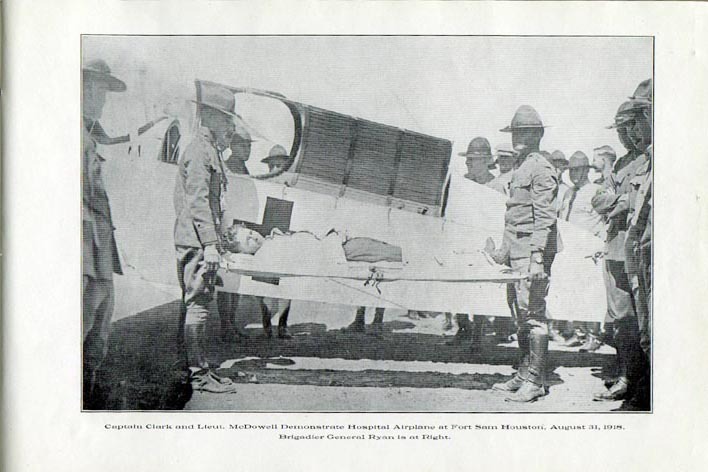 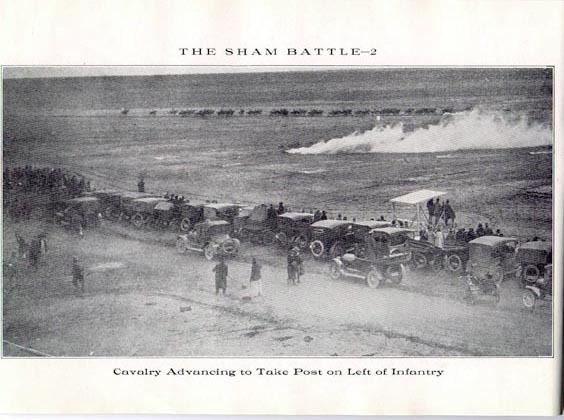 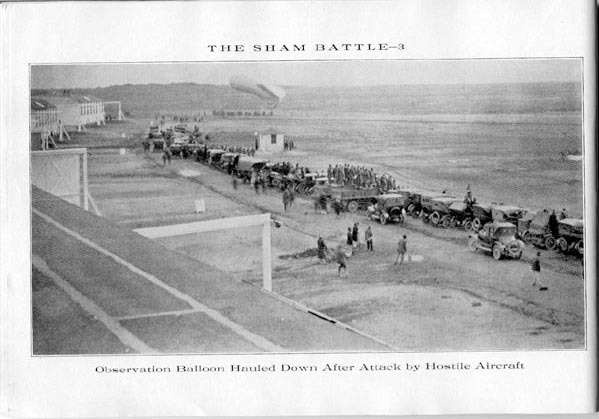 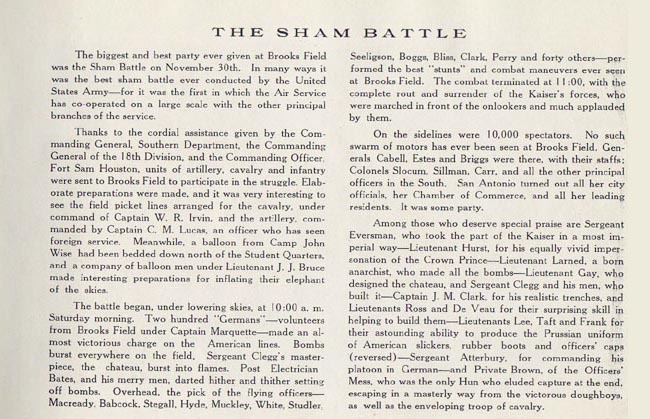 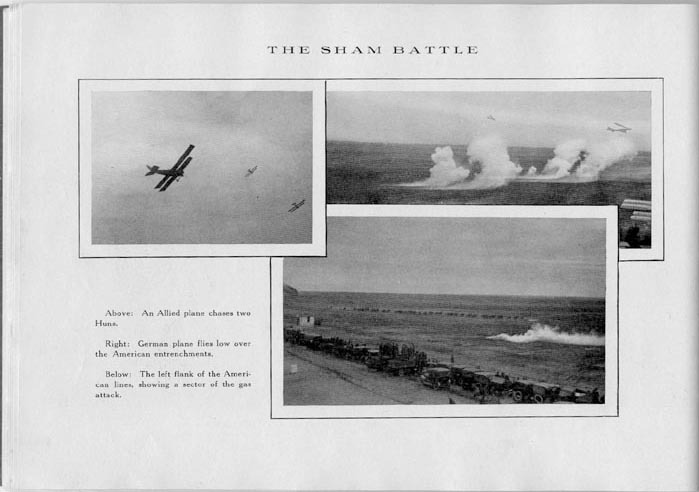 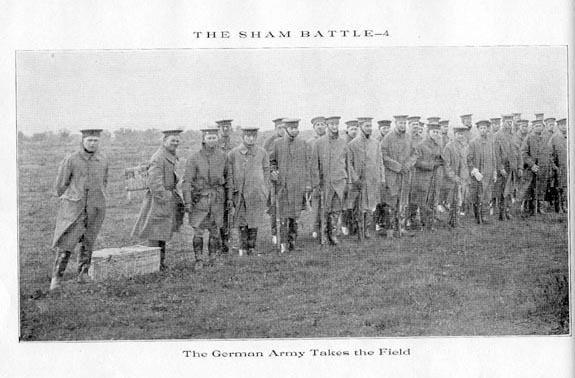 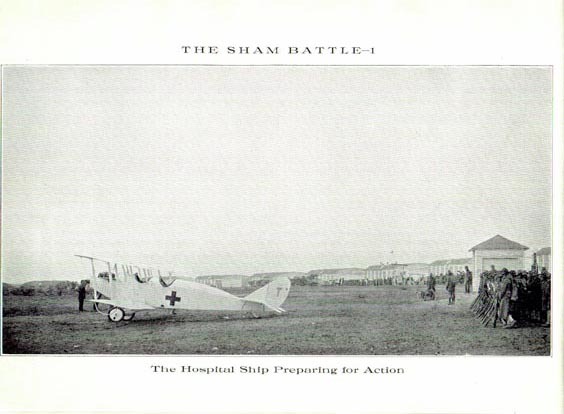 Page 7: Description of "Sham Battle"
Page 8: Picture of Hospital plane in "Sham Battle"
Page 9: Picture of "Doughboys" In "Sham Battle"
Page 10: Picture of Calvary advaning in "Sham Battle"
Page 11: Picture of Gas Attack in "Sham Battle"
Page 12: Picture of an Observation Balloon in "Sham Battle"
Page 13: Picture of Gas Attack in full process in "Sham Battle"
Page 14: Picture of German Army in "Sham Battle"
Page 16: 3 pictures of Planes in use in "Sham Battle"
Page 17: 3 pictures of "Sham Battle"
Page 18: Picture of 1st half of Squadron "A"
Page 19: Picture of 2nd half of Squadron "A"
Page 20: History of Squadron "A"
Page 21: The men of Squadron "A" by rank. 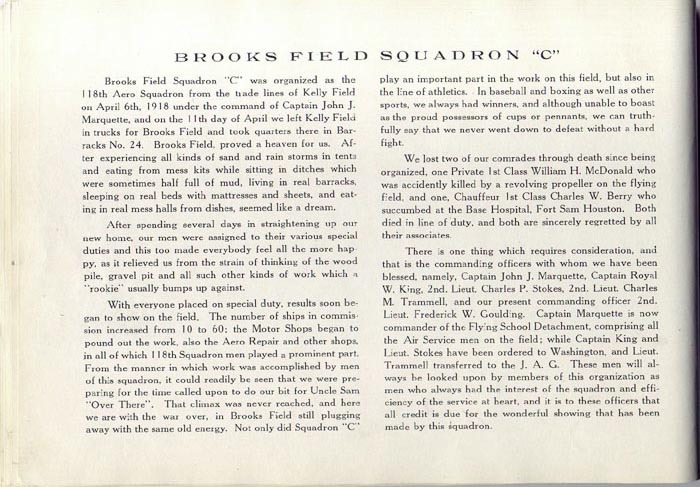 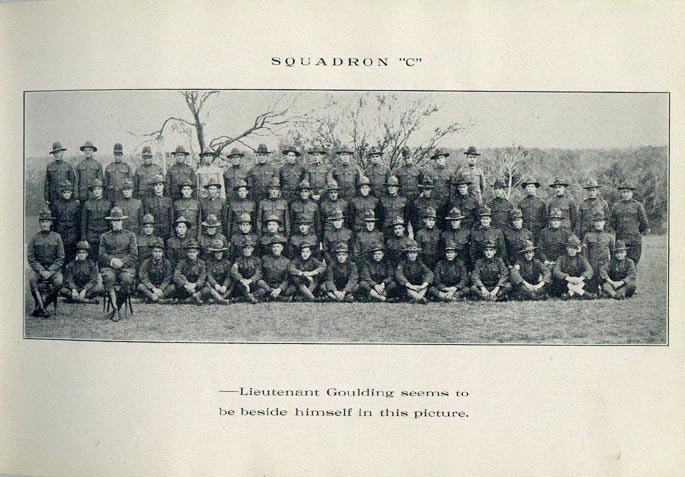 Page 22: Picture of 1st half of Squadron "B"
Page 23: Picture of 2nd half of Squadron "B"
Page 24: History of Squadron "B"
Page 26: Picture of 1st half of Squadron "C"
Page 27: Picture of 2nd half of Squadron "C"
Page 28: History of Squadron "C"
Page 30: Picture of 1st half of Squadron "D"
Page 31: Picture of 2nd half of Squadron "D"
Page 32: History of Squadron "D"
Page 34: The history of the Engineering Dept. 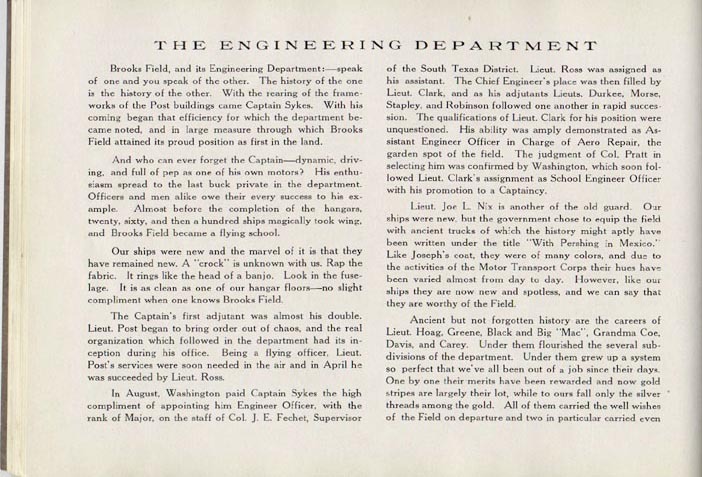 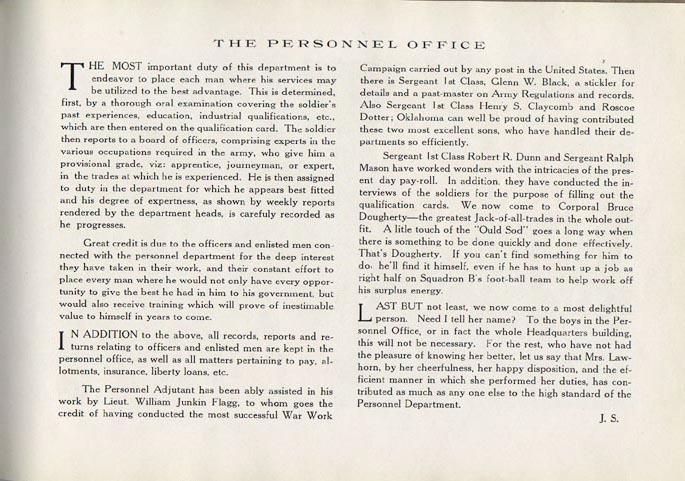 Page 35: 2nd page of the history of the Engineering Dept. 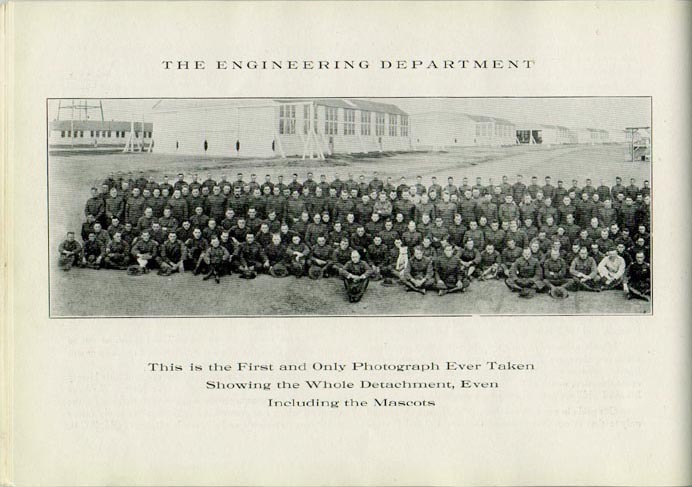 Page 37: Picture of the 2nd half of the Engineering Dept. 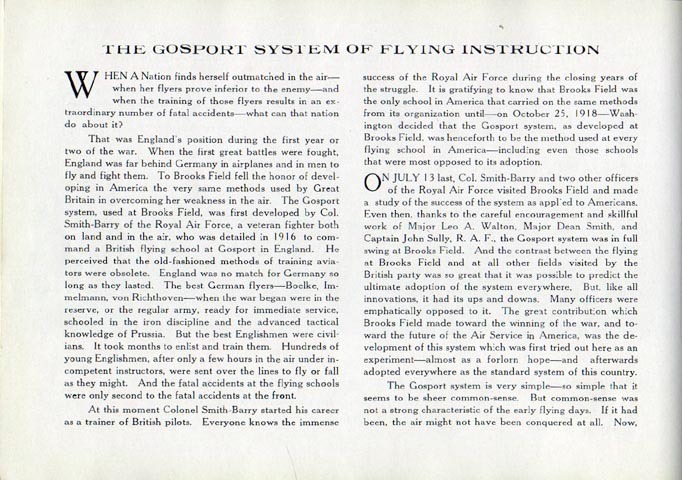 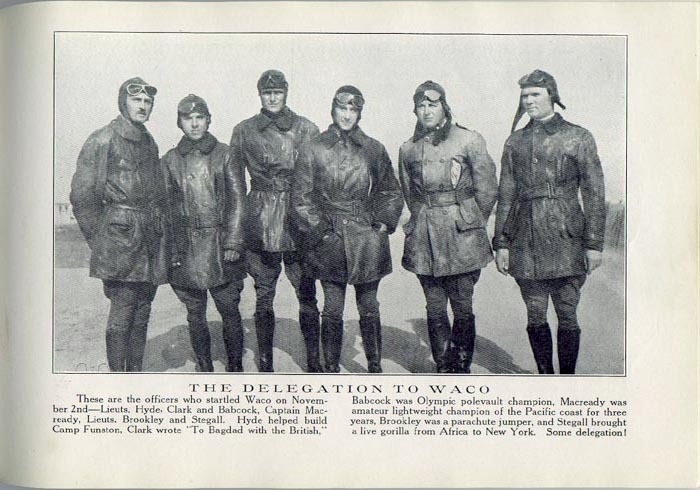 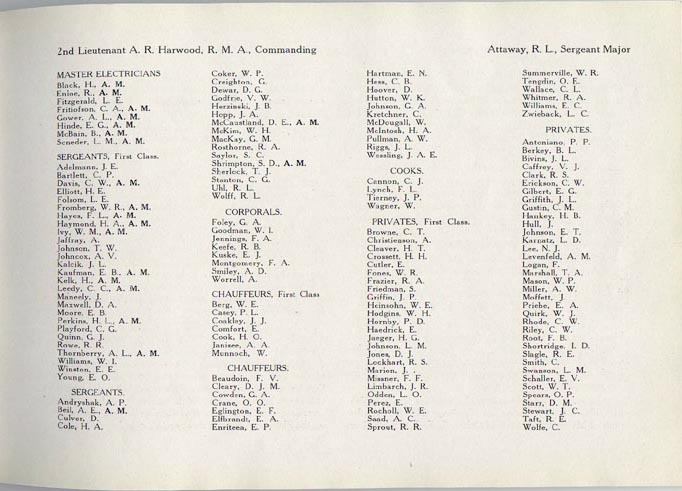 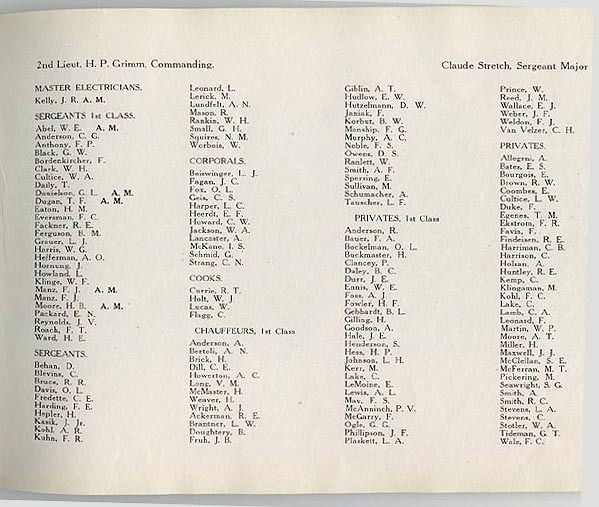 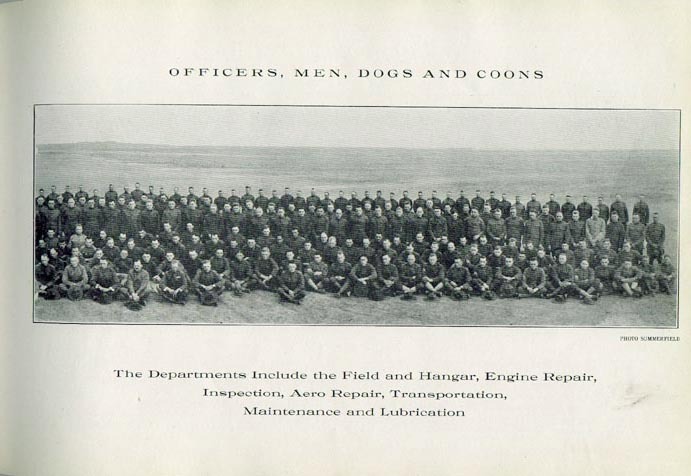 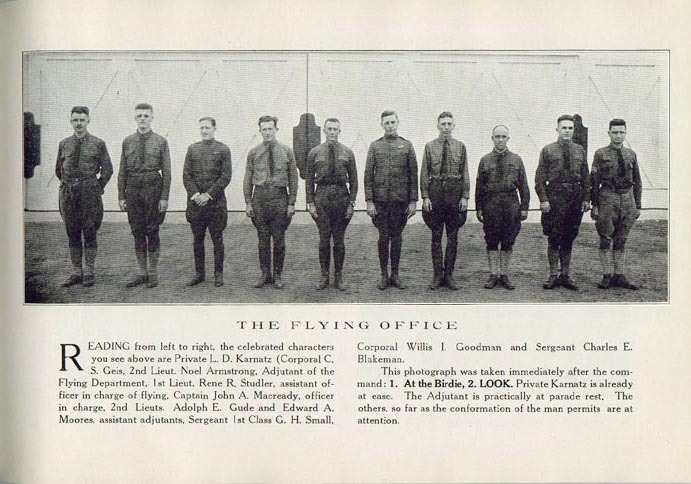 Page 42: Description of the "Gosport System of Flying Instructions"
Page 43: Continuing Description of "Gosport System of Flying Instruction"
Page 44: More of "Gosport System"
Page 45: Picture and description of "The Delegation to Waco"
Page 47: Picture and names of men in the "Flying Office"
Page 58: A special picture of "Cheer"
Page 72: In Memorium. 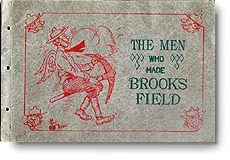 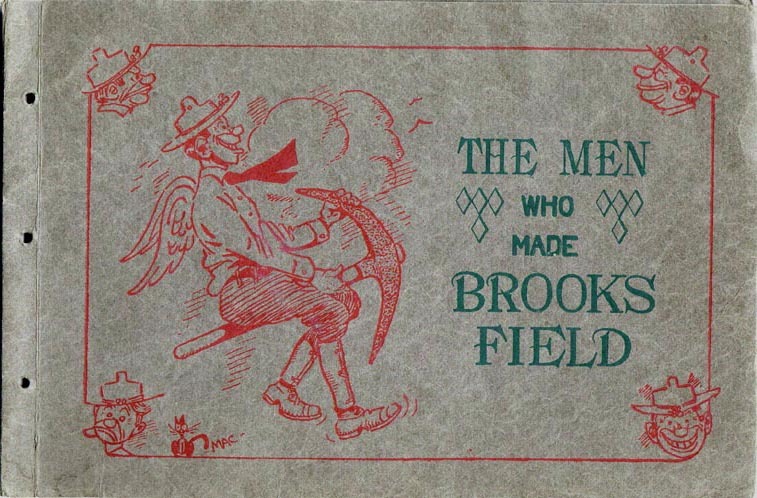 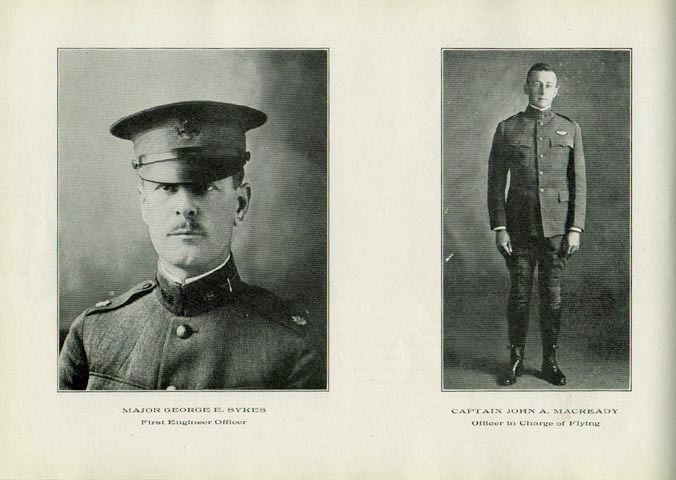 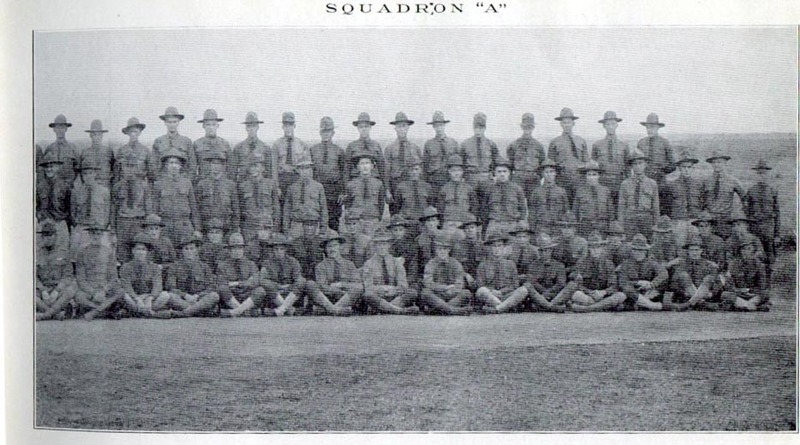 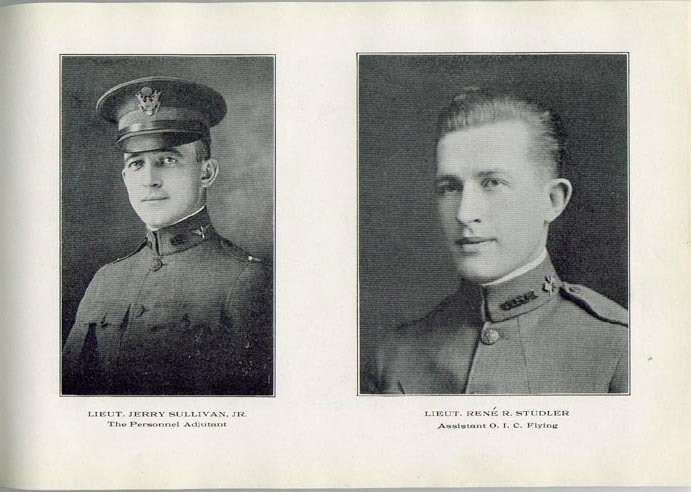 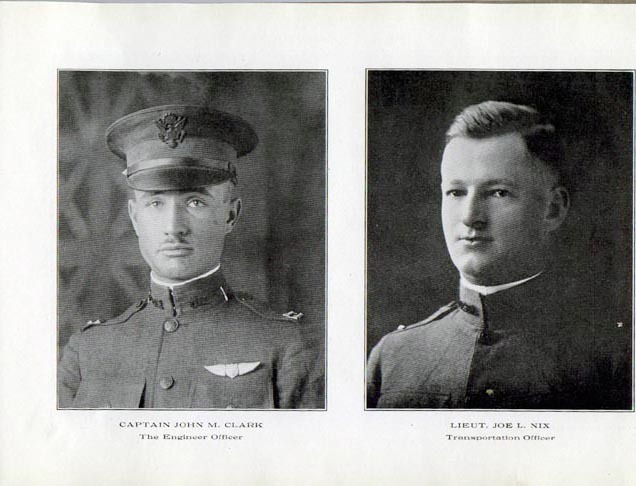 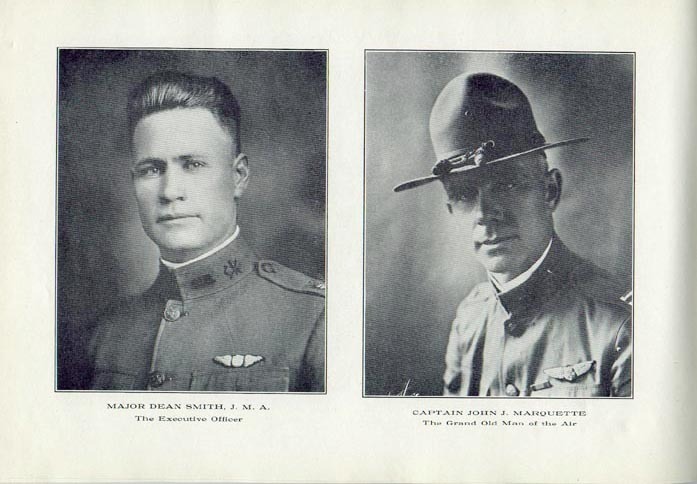 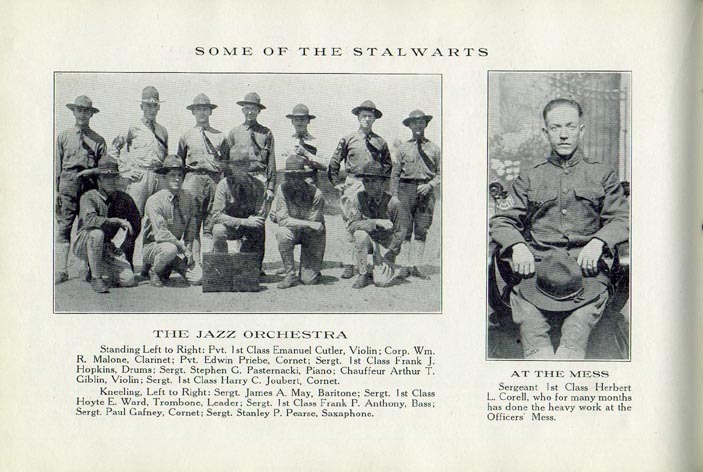 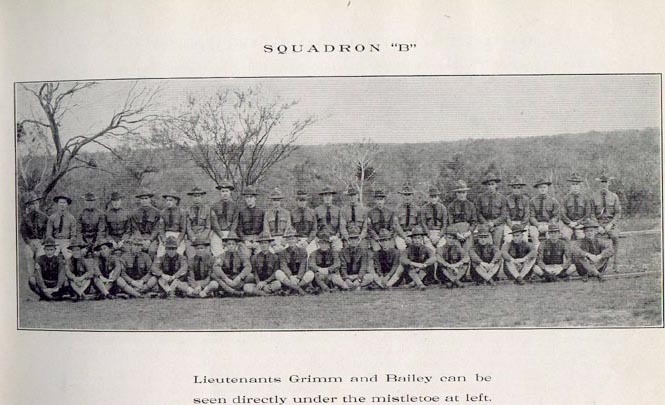 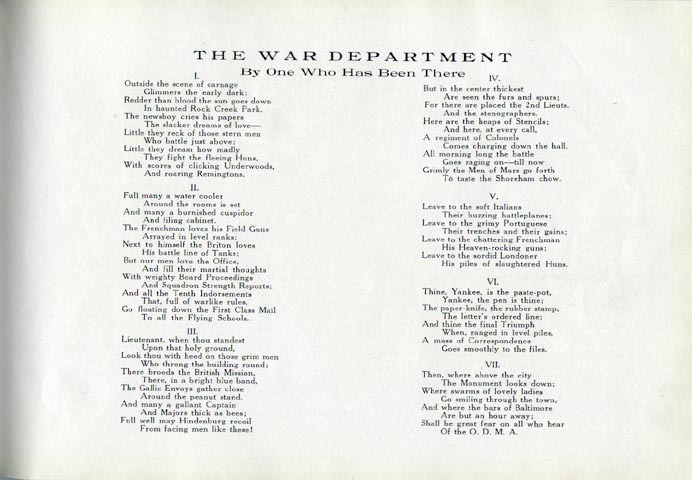 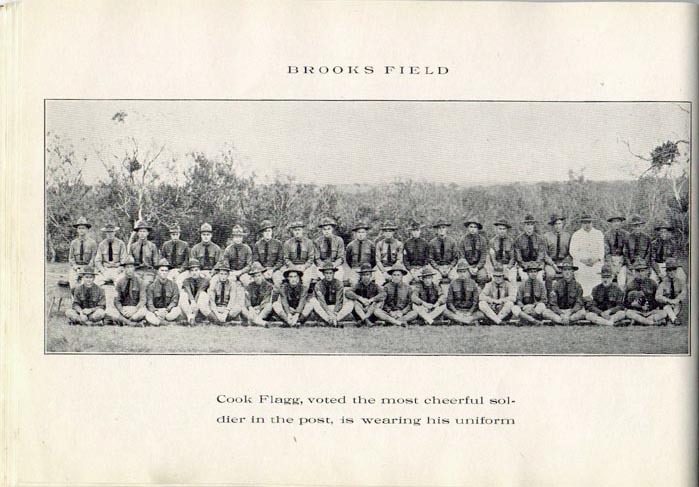 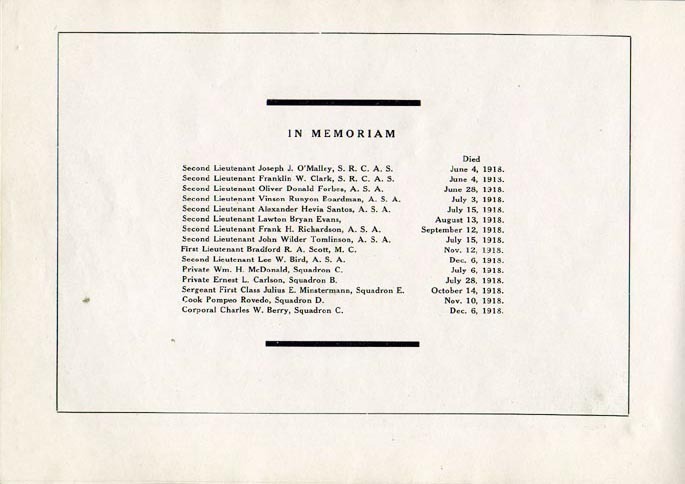 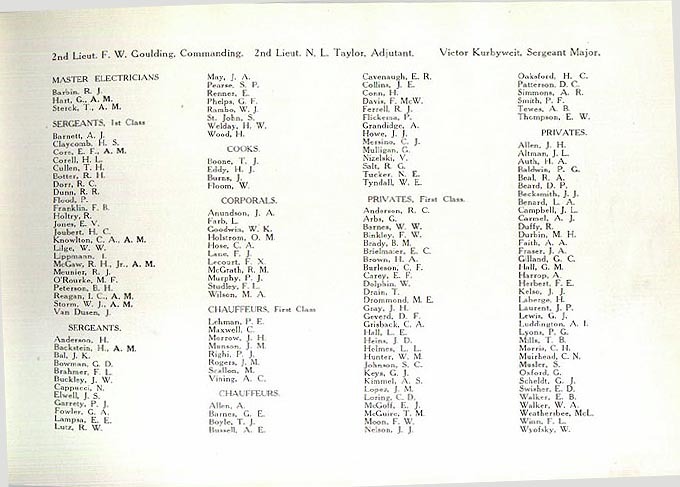 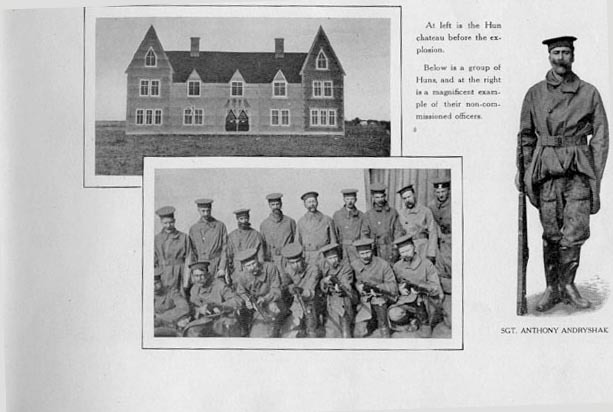 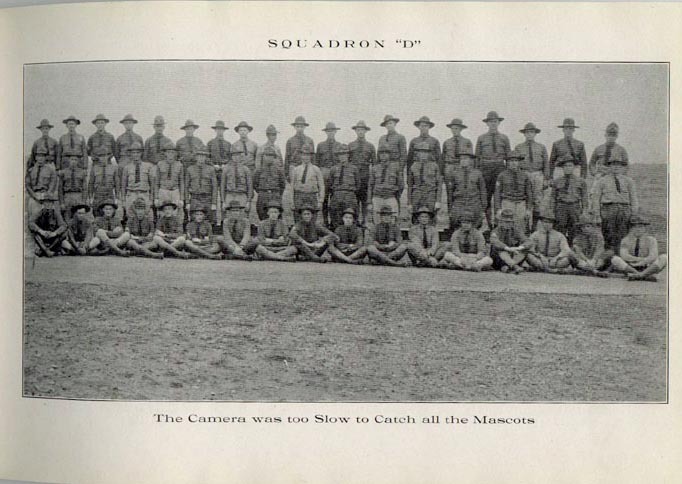 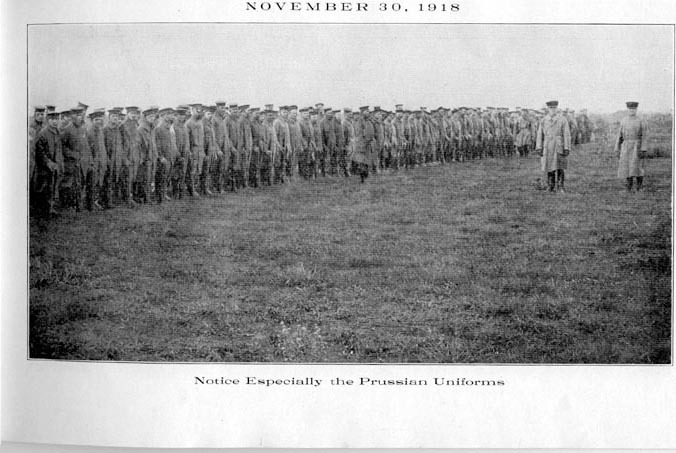 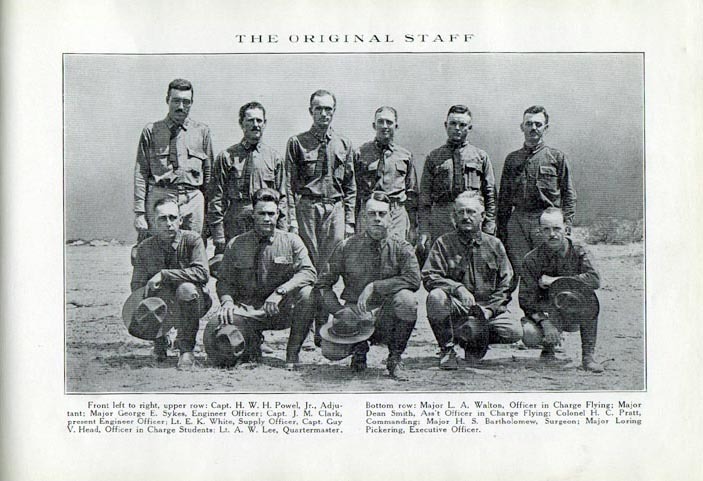 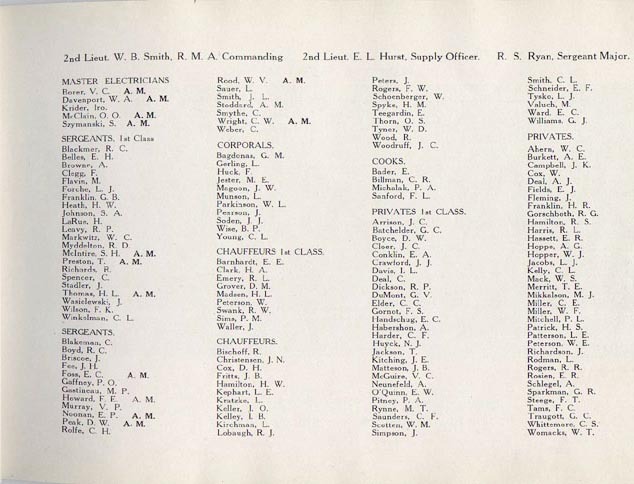 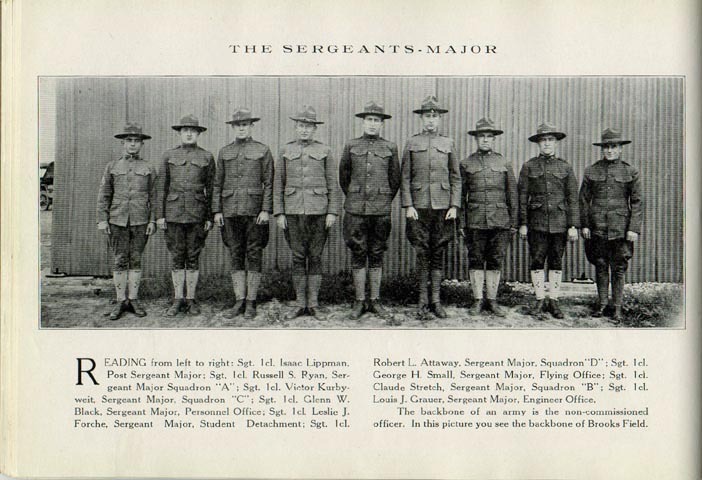 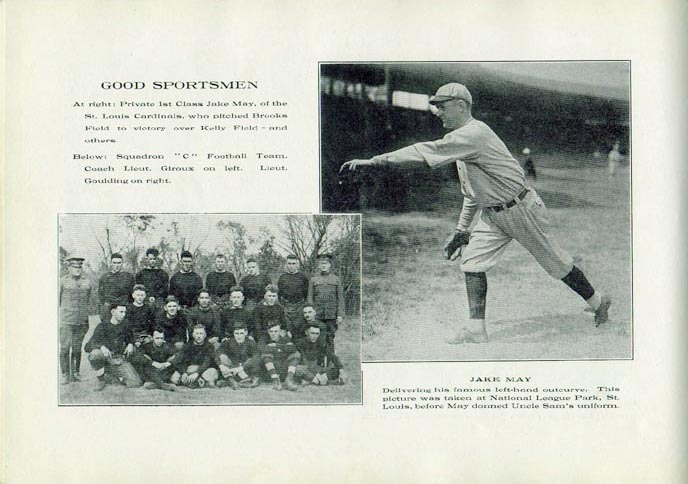 Men of Brooks Field who died. 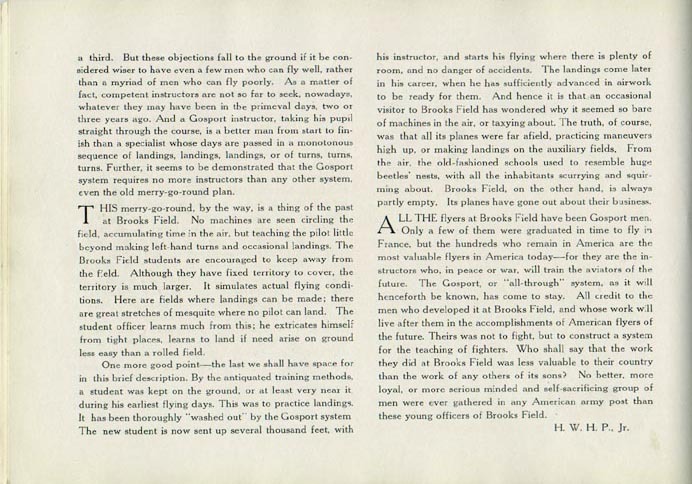 Web page by Micheal Shackelford, © September 2001. 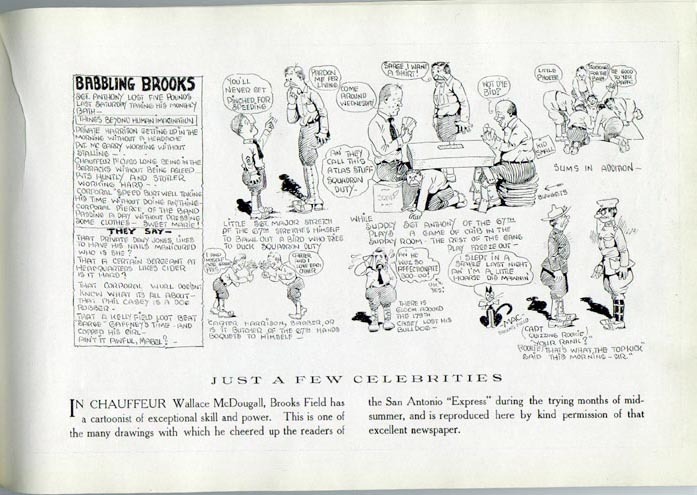 Contact me regarding any broken links. 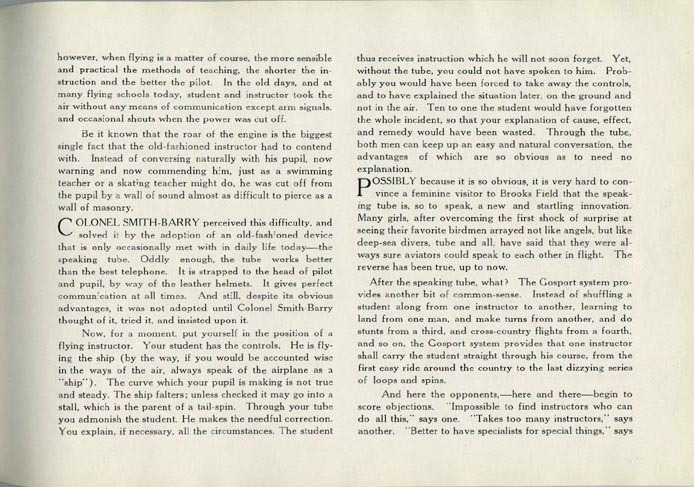 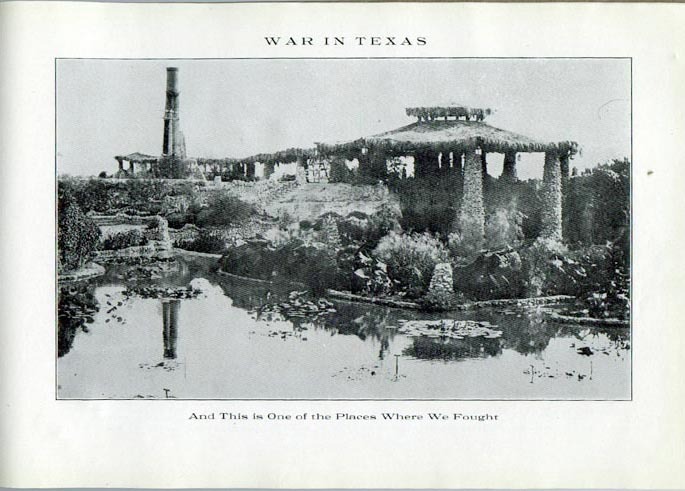 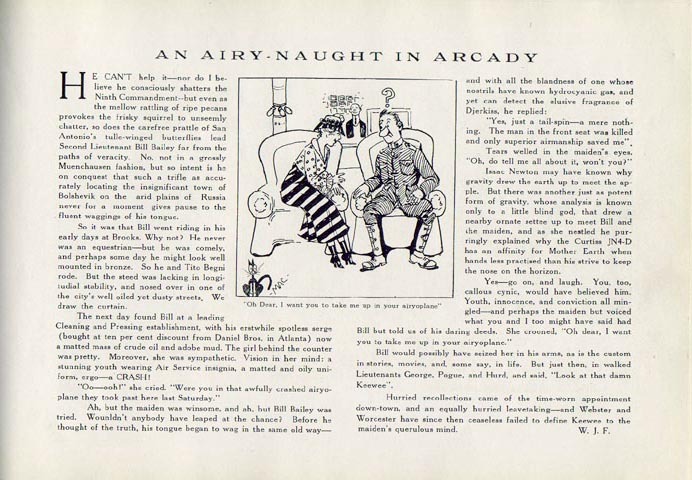 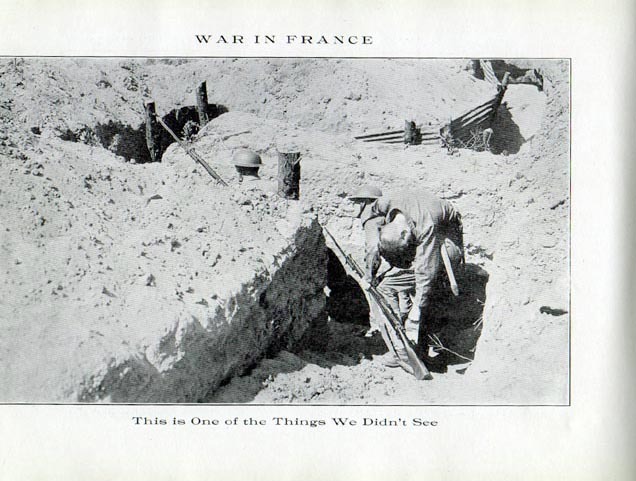 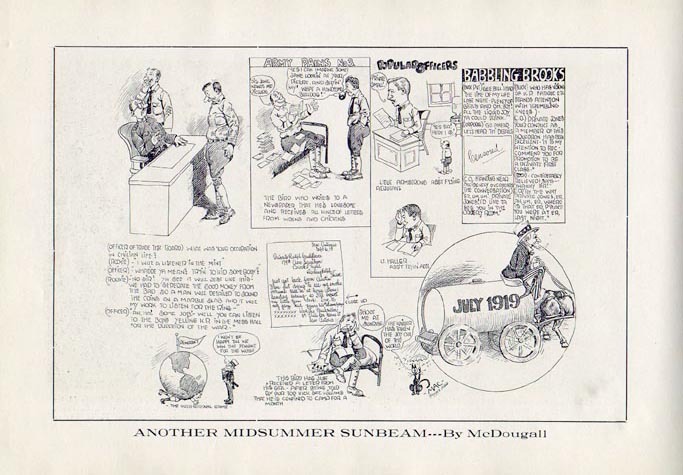 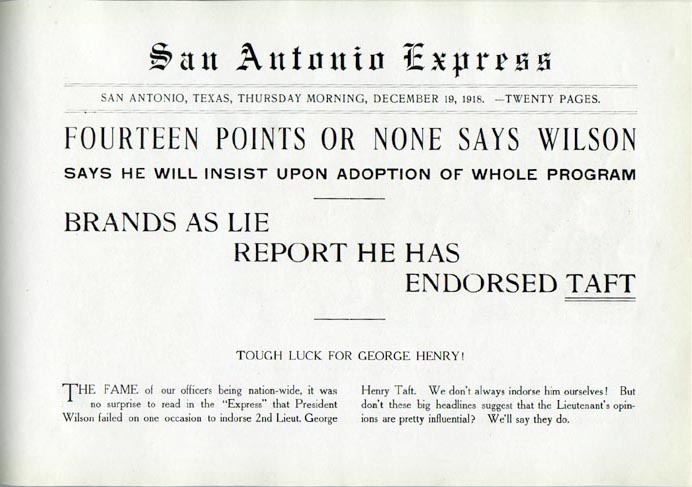 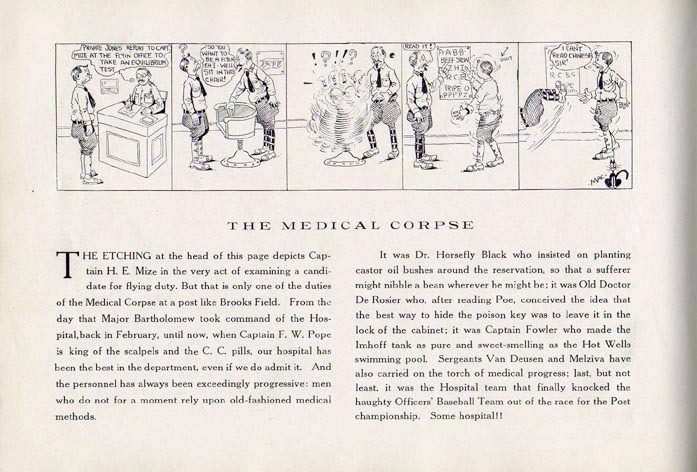 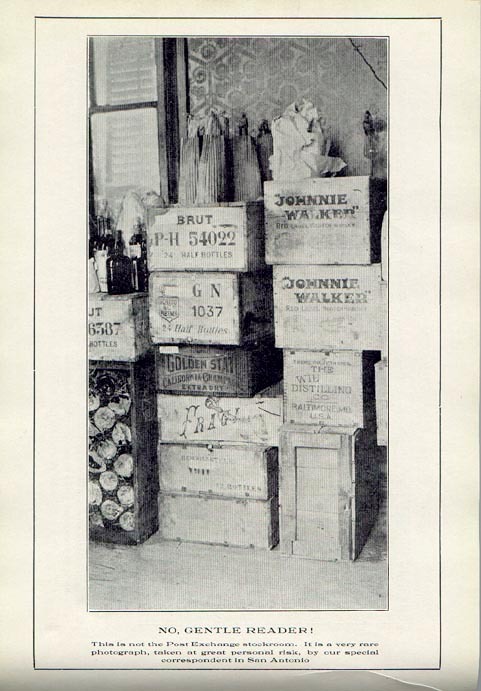 Content from a book in the possession of William Hunter, who provided the scans.